The Goodies 5.14 – Goodies Rule, OK? 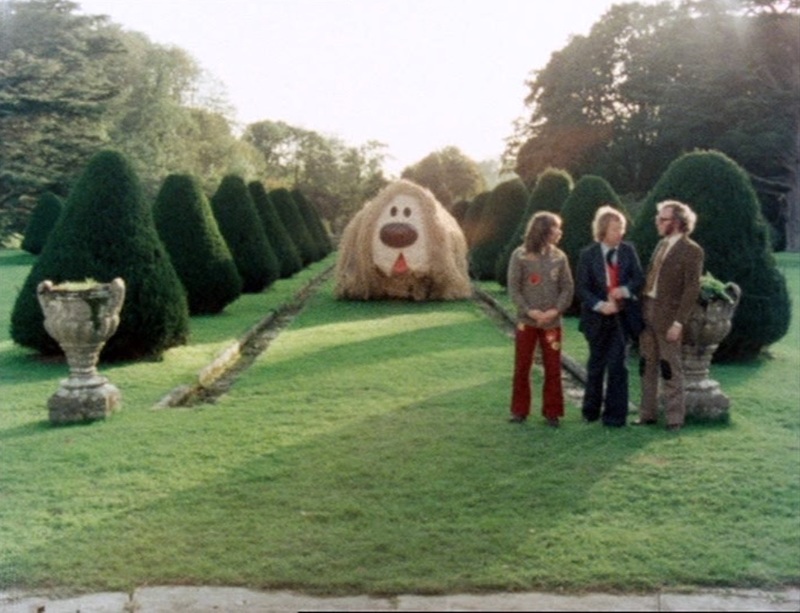 Second after that glorious shot of “Kitten Kong” knocking over the Post Office Tower, the other iconic and silly image of The Goodies is one of our heroes being menaced by an absolutely enormous Dougal from The Magic Roundabout. It’s the sort of thing you wish you had never seen, that had never been photographed, just to preserve its absurdity, but it’s also the sort of thing that you can understand the BBC publicity department pushing, and it was no surprise to see it on the cover of the third Network DVD collection. Nevertheless, for our second viewing of an episode of The Goodies, I again kept the visual a secret from our son by keeping him out of the room while I set up the episode, but I also prepped him with a little bit of the necessary background information to make the climax of this 50-minute episode more amusing. Over the course of the last month, we’ve watched a few episodes of The Magic Roundabout, The Wombles, and Clangers on YouTube. There’s also a new series of Clangers that airs in the middle of the night on Sprout (narrated by William Shatner! ), and he also watched the 2005 movie version of Roundabout with the amazing voice cast. Anyway, I’d only seen the last twenty minutes of “Goodies Rule, OK?” on YouTube, some years ago, and didn’t realize that our five year-old son certainly needed a whole lot more prepping to understand even a tenth of the jokes. 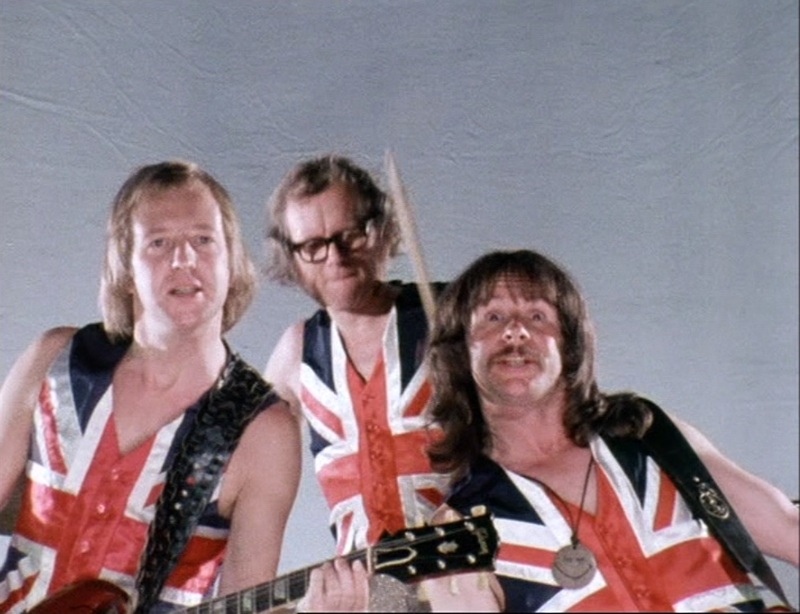 Basically, this is the Goodies version of a rewritten history of the previous fifteen years, with gags revolving around pop music, politics, light entertainment, royalty, and the Valentine’s Day Massacre. I’m sure I missed a pile of the jokes myself – I’m aware that there were entertainers called Tommy Cooper and Cilla Black in the seventies, but I’ve never seen their acts – but mercifully, our son wasn’t too bored. There was just enough of the slapstick and silly voices to keep him chuckling. The plot goes like this: after fifteen years of having their daringly original music stolen by no-talents like the Beatles and the Supremes, the Goodies pilfer all the styles of the chart acts of 1975 and become the biggest band in Britain, saving the music business while simultaneously bankrupting the nation. With the United Kingdom underwater in debt, and in water, they cheer up the country with a tune called “Bounce,” leading Prime Minister Harold Wilson to bounce off a balcony and a General Election is called. Eventually – I’m skipping a lot – the Entertainers Party takes charge and installs a puppet government. Of puppets. Led by Prime Minister Sooty and Home Secretary Sweep, the puppets are very, very naughty indeed, and so the Goodies raid the PM’s country estate to show them who’s pulling the strings. In an escalating series of ridiculous sight gags, the Goodies do battle with the Clangers, Pinky and Perky, the Flowerpot Men, Andy Pandy, a sort-of Oscar the Grouch, and the Wombles, and then, funny bone prepped by all the amusing silliness, they calmly play their masterstroke and introduce an enormous – no, an absurdly enormous – Dougal and Zebedee. So how’d it play with the youngun? Not anywhere as well as “Kitten Kong,” honestly. He’s too young, and too far removed from the pop culture of the seventies, to really even understand this thing, but the war against the puppets is truly hilarious and he asked to watch that part again. Me? Even knowing it was coming and having seen it before, it still slayed me. The Dougal prop is just so huge and so ridiculous that I just collapsed in stitches, and I’m – no affectation – the loudest person on Earth when I laugh. When I’m in hysterics like that, our son has this rather obnoxious habit of trying to force an equally loud laugh when he’s really only chuckling, and I actually had to tell him to knock it off!